I showed Bitter some new settings to use on her digital camera that allow setting the exposure time to a few seconds and opening the aperture a little. 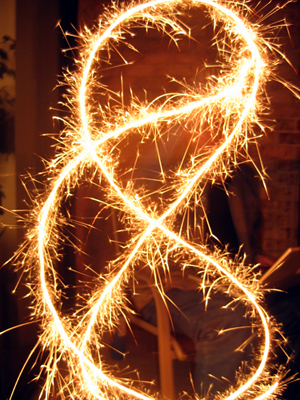 Just twirling your standard sparkler. We’re sitting out on the patio watching what little fireworks the neighbors are bringing out. Bitter needs to move farther south where I can crack out shotgun launched pyrotechnics without having to worry about the police showing up.